Our world is surrounded by technology on a daily basis, especially when it comes to small business owners. When it comes to the use of digital signatures, small businesses have created a world that changes the way we create a simple, easy and fast deal, no matter how big or small the project is. A digital signature provides an electronic signature that encrypts documents and business contracts with a specific digital code in order to verify that it hasn’t been altered. 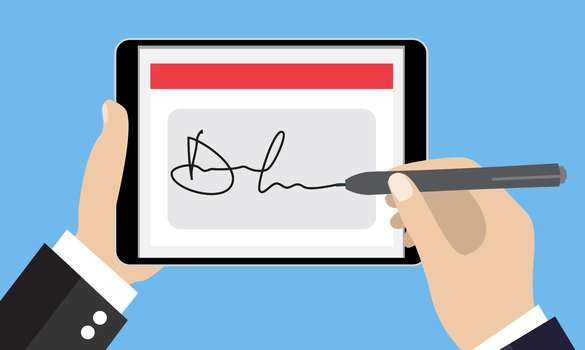 Whether it’s signing a document for an invoice or confirming a deal made between you and another business, digital signatures make it possible for these agreements to be made efficiently between business owners and clients, with the simple use of just a few clicks. Below, you will see the different features that your digital signature service needs to have readily available for you. There is limited room for error when it comes to being a small business owner, especially when it comes to your legal documents between your potential clients and vendors. Having an autofill feature will help eliminate any user error and create a swift experience between you and your client. Simplicity is key when it comes to the business relationships you make along the way. The internet can be an unreliable place depending on how careful you are with the different services you sign up for. It’s extremely important to ensure the safety of the documents you’re sending and receiving, creating protection of the document. Ensure your digital signature service goes above and beyond to meet the security certification standards. Having this sense of security between you and your client knowing your document is in safe hands makes all the difference. It’s important for your document to be easily tracked, just in case the time ever comes where you need to legally prove that the signature happened at a specific time or someone tries to claim that they never signed a type of commercial lease or document you had sent over. Having an audit-trail is crucial to tracking the steps of the signature, along with all of the other information you would need to have readily available to prove the signature happened. Making sure your digital signature service has a digital audit-trail feature is key to ensuring the proof of when the signature took place. Majority of the time, your legal documents involve more than just one signature. Business law firms need to organize hundreds of documents for a single company. Assigning roles to different people within your business or your different clients can make all the difference. Make sure your digital signature service allows you to assign a signer, acceptor, form filler and delegator to move your business in the right direction. When you have a flow that is simple and easy to track, it makes the signing process much simpler. Let’s face it, the majority of business owners are constantly on the go. Just because someone is not physically in the office, doesn’t mean their business relationships should be on hold. Your digital signature service should offer a downloadable app that you can have available right on your smartphone in order for you to sign documents, no matter where you are. Having this ability will provide a sense of comfort to you and your client, knowing that neither of you need to be in an office setting to complete the signing process. These different features are crucial to finding the right digital signature service that will ultimately protect you and your business relationships. The main features you need to look out for will involve simplicity, security, tracking and accessibility. These will be the main drawing points that will have you either join the digital signature service world or switch to a service that provides you with these critical features.